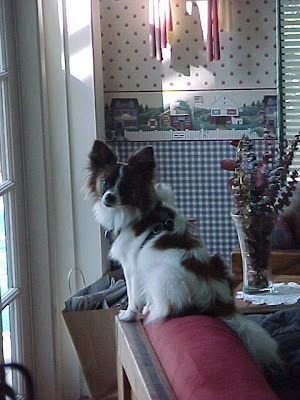 All Things Dog Blog All Things Dog Blog: Assuring that Your Puppy Does Not Claim the House, or Worse--You! Assuring that Your Puppy Does Not Claim the House, or Worse--You! He's cute; I know. But is it a good idea to allow your puppy to sit on top of you like this? Although not all experts agree, many say that allowing your dog to be on top of you, at his choice of time, encourages him to claim you. This can turn very bad if it continues. When a little dog claims his human, he often can become possessive and protective, growling at anyone who attempts to pet him or pick him up while atop his owner. Am I suggesting you never let your pup sit on our lap? Of course not. But I would advise that YOU choose when and for how long. As long as you are in charge of this affection that is being shared, your dog will understand who is in charge. 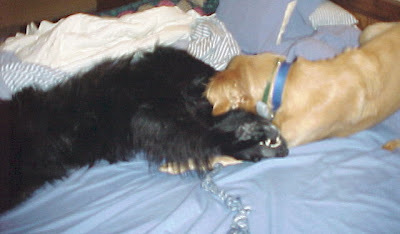 As with many other doggie games, wrestling is not appropriate for my bed. Of course that didn't stop me from capturing this image of my two big guys having a romp. It was cute. Thank goodness they rarely choose my bed to play. All I had to do was let them know the bed was off limits for playtime, and they dispersed to the floor, where they continued their game with renewed vigor--and more safety. I don't want anybody falling off the bed and getting hurt. When you are eating, keep in mind that dog manners are all about respecting who the food belongs to. When we take to the table for a meal, the dogs often lay at our feet, enjoying the smell of whatever is wafting from the table. That's just fine, as long as they aren't table surfing or begging. I don't allow that, and fortunately have never had to deal with it. Begging is a behavior that is best prevented early. Set boundaries for where your dog may sit or lay during a meal. Any barking or whining and the dog goes out of the room; no questions asked. Finally, table scraps fed to your dog from the table will only encourage begging. If you wish to share a small scrap of lean chicken occasionally, wait until the meal is over. Place the scrap in your dog's dish. Ask him to wait until given permission to eat it. This will establish YOU as the owner of the food. That's your goal. Every dog should have a refuge, a place all his own where he can find relief from rambunctious family members, guests that make him uneasy, or just to rest uninterrupted. That's exactly what a crate is for, once he is house trained. Even when your dog is completely housebroken and respectful, she may enjoy quiet, down time in her crate when the family is playing a boisterous game or she just generally wants some time to rest. I've known a few families who have packed up the crate when their pup was house-trained, only to decide later that it was still needed--yet unwanted by the dog. We learned the hard way that moving a dog's crate is serious business. 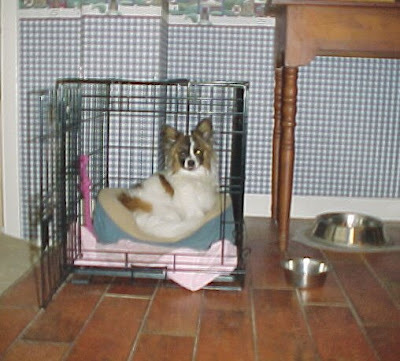 Xena's crate was originally located in our laundry room. It was perfect--no windows or access to noisy family activity--for her quiet time needs. When we renovated the room, we decided to move it. That's when we learned that she was absolutely not going to use a crate that was near a window. It took 3 more moves to find the spot that worked for her--my quiet, windowless walk-in closet. 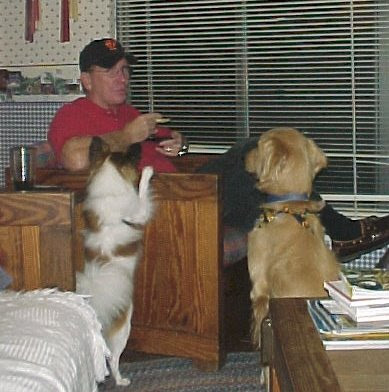 Cesar Millan would not have approved, but then he wasn't even a blip on the map back then. I was going it alone. Here in Central Florida, the thunderstorm capital of the world, Xena has much need for her crate during lightning storms. Even at 12 1/2, a girl likes a cozy space to hunker down during a storm. Here We Go Again. Off Oliver! No. Oliver is not perfect. 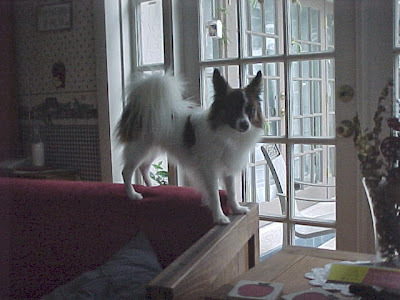 As you can see from the 2 photos above, he is on the top of the couch. Granted, this is the "dog couch"--the one they are allowed to lay on. Well, I should clarify this; they are allowed to lay on this couch IF and only IF no one else wants to sit there. BUT...they are not allowed on top of it. I'll admit that Oliver does not do this often. He's watching Tanner in the pool, through the French doors. This is his way of telling me he isn't in the mood to swim--by keeping his distance and watching his waterlogged brother hang 10 on the raft. Entertaining, but not always Oliver's choice of activity. So, did you get the point of this post? It's all about taking control of where your dog is allowed to be--and when. If you set these guidelines early, enforce them regularly, and don't give him any wiggle room, he'll learn to abide by your rules--eventually.